Ridiculously tender, moist, and easy to whip up! 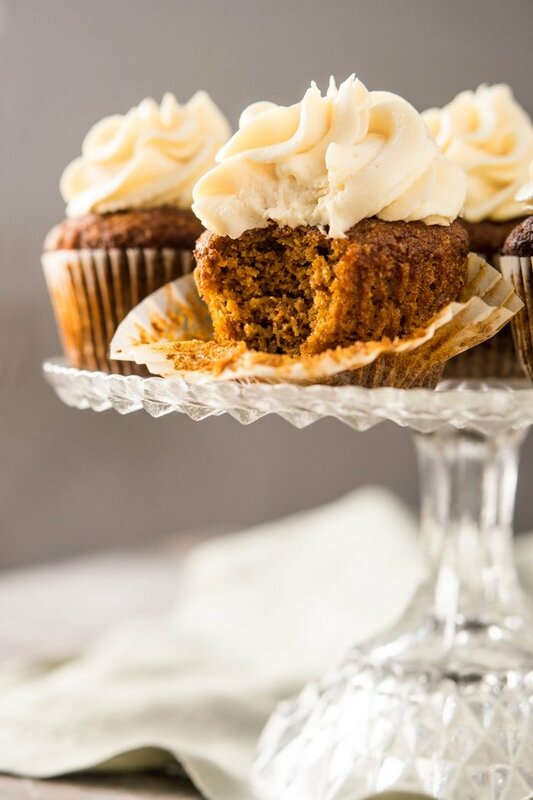 Your go-to gluten free, paleo and keto carrot cake (or cupcakes! )… at just 3g net carbs! Whip it up as a fancy-pants layered cake, or keep it simple as cupcakes. 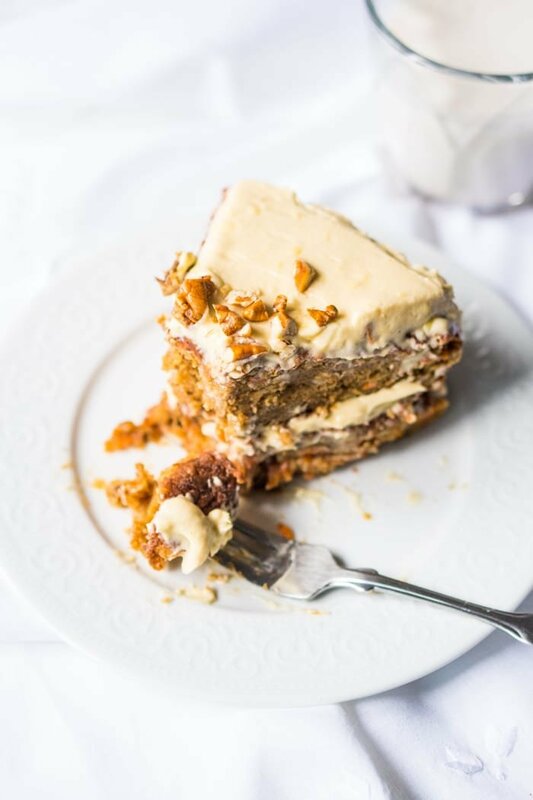 Either way, you can expect a classic carrot cake experience through and through! And don’t be turned off because ‘carrots aren’t keto’ (of course they are, just not in huge amounts!). The added carrot here is very similar to say pumpkin puree: while you can’t chug an entire can of the stuff, you can surely enjoy it sparingly. Keto is a metabolic state after all, not a list of foods (and thaaank goodness for that!). Oh, and an absolute must is it’s ideal companion: our cream cheese buttercream frosting. Just keep in mind that for best texture and rise, you’ll always want to regrind your psyllium husk (or powder) and golden flaxseed meal in a dry blender or bullet. And it seems that, by regrinding your psyllium, you are lowering the odds of it turning your baked goods purple (hooray!). You’ve got good options here. Erythritol (Lakanto is awesome here), allulose and xylitol (non-corn though to avoid tummy troubles!) are my top choices (no aftertaste at all!). 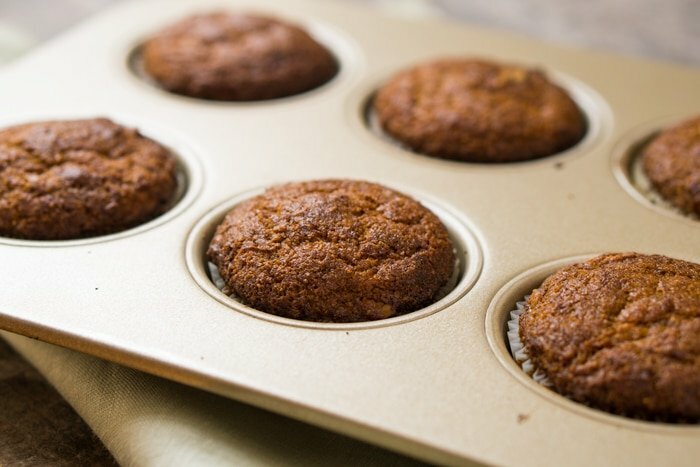 Pyure is also a good one for muffins and quick breads, particularly if you’re trying to limit your sugar alcohol consumption (it’s added stevia makes it twice as sweet as sugar… i.e. you add half!). Oh, and if not restricted by sugars (i.e. paleo), simply sub 1-to-1 with coconut or regular sugar. Ridiculously tender, moist, and easy to whip up! 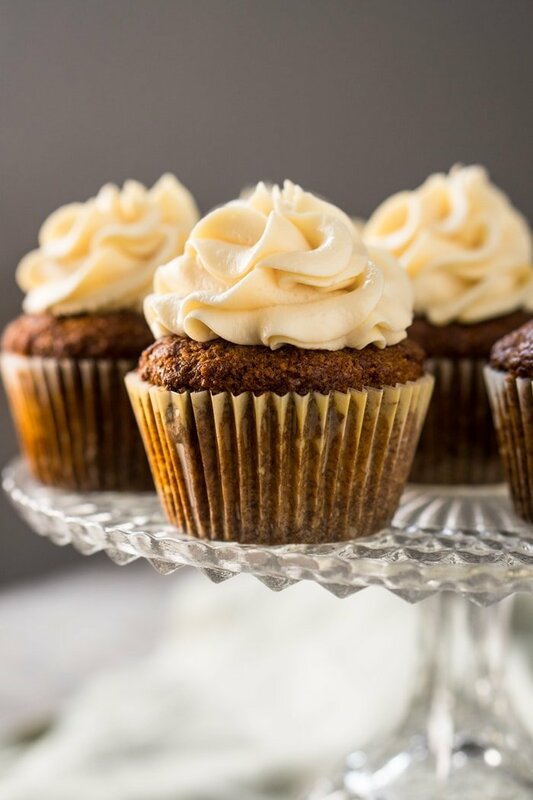 Your go-to gluten free, paleo & keto carrot cake (or cupcakes!) at just 3g net carbs! 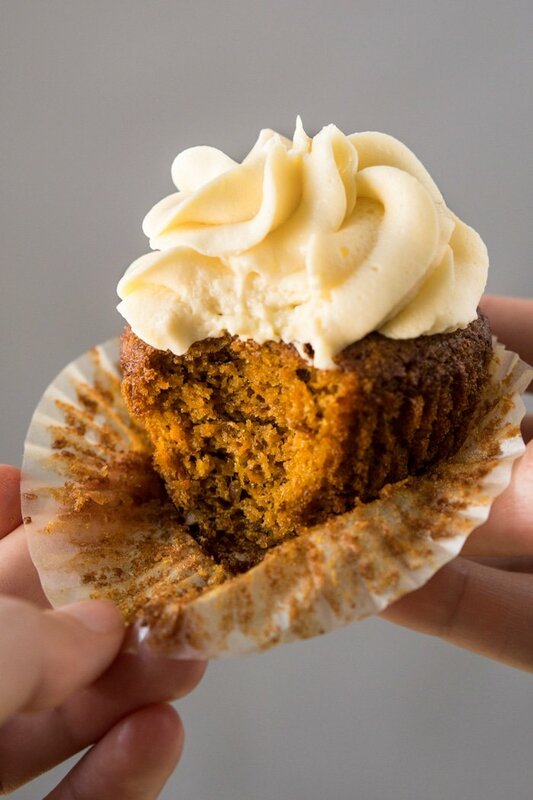 If baking a layered carrot cake rather than cupcakes, change the serving size to 12 for two layers and 18 for three. Preheat oven to 350°F/180°C. Line (or grease and flour) a muffin pan or cake pans, set aside. Whisk together in a medium bowl almond flour, flaxseed meal, psyllium husk, baking powder, baking soda, salt, cinnamon, cardamom and ginger. Set aside. Cream butter in a large bowl until softened (1 minute), add the sweetener of choice and continue to cream until light and fluffy. Mix in vinegar, vanilla extract and orange zest until fully incorporated. Mix in the eggs one at a time, the batter will appear slightly 'broken' (don't worry!). Add in the dry flour mixture in two parts. Mix for 2 to 3 minutes until fully incorporated and elastic, the batter will thicken as you mix. Fold in carrots and pecans. Distribute batter evenly into pan, smoothing out the tops with wet fingertips. Bake for 17 to 20 minutes, until deep golden and a toothpick inserted comes out clean. Check in on them after minute 10, and cover with aluminum foil as soon as they begin to brown (minute 13 for us). Allow to cool for 15 minutes in the pan before removing, and cool completely in a rack before frosting. If building a layered cake: once cool refrigerate for 2 hours or overnight. 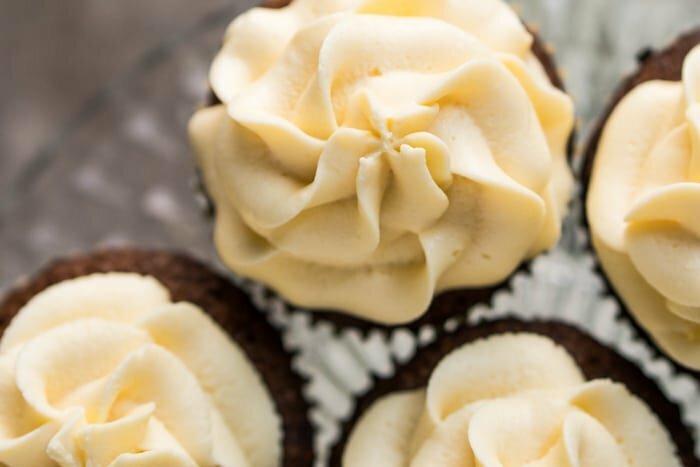 Make your cream cheese buttercream frosting while your cupcakes or cakes are cooling. And frost away! If frosted, keep covered and refrigerated for up to 3 days. Without the frosting store in an airtight container at room temperature. *For best texture and rise, always regrind your psyllium husk (or powder) and flax meal in a dry blender or bullet. Please note that nutrition facts were estimated without the buttercream frosting. Hi Paola, how are you doing? I need to use sucralose or stevia as in my country can´t find the mentionned ones. Can you suggest the correct grams or envelopes? Tks! I’m good Dinah thanks for asking! Honestly I haven’t tried baking with those sweeteners, but if they’re 1-1 I’m assuming just a straight sub? I don’t use flax meal,can I just add more almond flour instead? Thanks! Sorry, I know it must be annoying having people ask for substitutions on ingredients when I know it probably was a lot of work for you making it perfect. I just didn’t wanna miss on something that looks so delicious just because I can’t have one ingredient. Thanks though! Love your recipes! I’ve used an equal measure of psyllium husk in Paola’s Ultimate Chocolate Cake recipe instead of the flax meal, and it’s very, very good. I’ll be doing the same when I try this, so maybe that’s worth trying for you! It does bump the net carbs but it’s pretty negligible across the whole recipe. Thanks! I’m gonna try that! These were excellent! Did a bake off making small batches of several different carrot cake recipes to find out favorite. This was our winner! Wouldn’t have known it wasn’t a flour and sugar carrot cake- perfect taste and texture. Jennifer that’s so awesome to hear, glad they came out on top lol 😉 xo!! This is the 2nd time I have tried making these and both times they are very dense….. what am I missing??? And not rising at all. Are you making any subs Charli? Possibly using regular flax as opposed to golden? All ingredients at room temp? I’ve made these a couple of times now. I love these cupcakes! The only issue I’ve had was the tops of the cupcake sinking. I make sure that I’m cooking them all the way through (I check with a toothpick). Can you tell me what I’m doing wrong? Can overmixing lead to this? The taste and texture is the best though! Any advice on preventing the tops from sinking would be appreciated. Hi. I just made these and I’m sure I did something wrong. The cupcakes sank and aren’t rounded on top. Any advice on what I did wrong? Sounds like they just needed longer in the oven Michelle di! 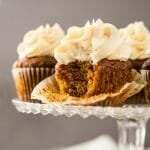 I made these cupcakes using sunflower meal instead of almond flour. Instead of orange zest I used pineapple extract. Delicious, thank you for the recipe. Hi Laura, I’m interested in your recipe, could you kindly share? I can’t really have nuts so I usually try to reduce or replace the ingredients with nuts. What would be the nutritional info for a cake? I don’t do cupcakes….. 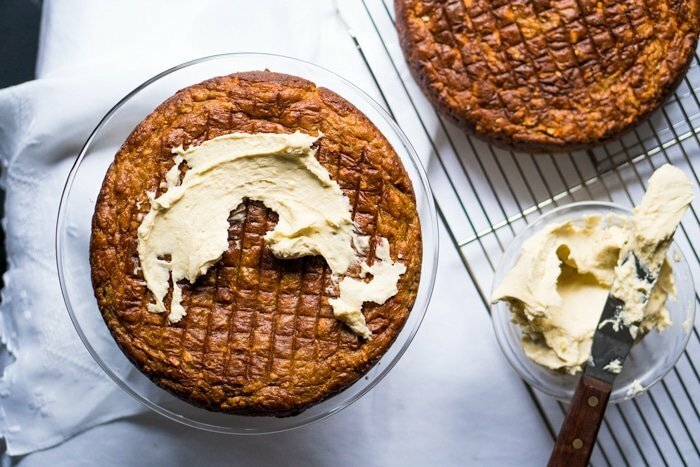 I love this carrot cake; the only thing I did differently was to save the nuts for sprinkling on top of the cream cheese frosting instead of adding them to the actual cake batter. I love the crunch of the nuts on the frosting! These are amazing! I have made them 3 times since you posted the recipe. The crumb is unbelievable and opens up so many possibilities!!! I just need more kitchen time! Made these and they were good (made them in a brownie pan cause thats all I had on hand). Baked mine for a total of 30mins, covered with foil at around the 20min mark. Topped them with the cream cheese frosting and they were good. Definitely a good dupe for the usual high-carb version, can definitely satisfy any craving you may have well. I’m not Keto. But I did want a low carb gf carrot cake. But I wanted one w pineapple- Keto cake add pineapple, still low carb. So I made a triple batch for a triple lawyer cake, strained most of the moisture out of a 398ml can of crushed pineapple and added 1.5tbsp of coconut flour. It was fantastic. And everyone loved it. I made these this afternoon and they came out great! I’ve eaten 2 myself. 😀 Delicious. The only thing I had to adjust was the cream cheese buttercream frosting. It tasted a little too much like cream cheese for me so I added in all 6 tbsp of monk fruit sweetener. I have a feeling they will be even better after spending some time in the fridge. Thank you!